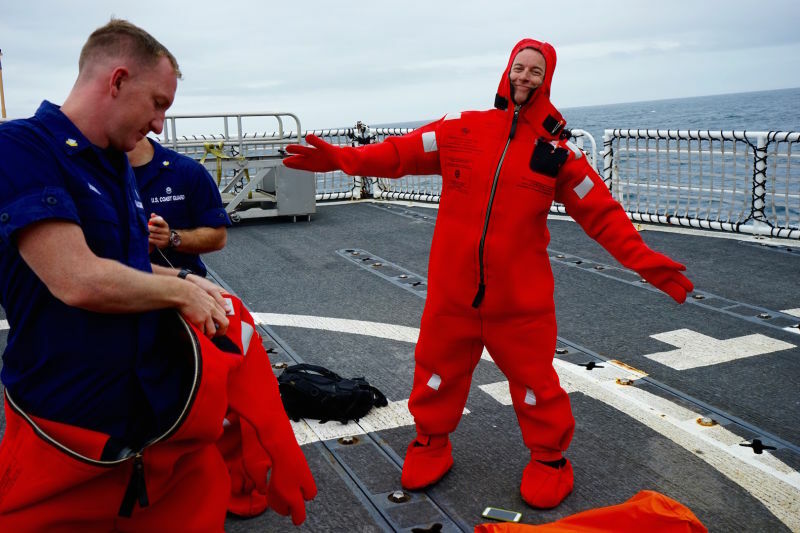 The second in a series of dispatches from freelance writer Brandon Reynolds aboard the USCG icebreaker Polar Star, on its annual resupply mission to the Antarctic research base, McMurdo Station. It's a critical task imperiled by the nation's aging, shrinking fleet of ice-breaking ships. I'd been awakened in the middle of the night by a shadowy figure at the door. 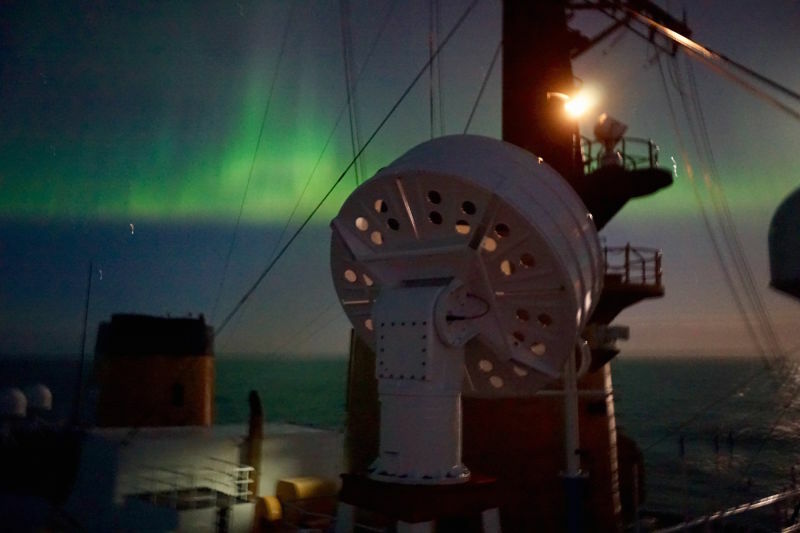 I went out and up and onto the deck of the Polar Star, which was making its way south to Antarctica. Its mission was to break some of the ice there. Not all of it, but some. Outside it was still dark, which was getting rarer by the day. Up above was the Aurora Australis, the Southern Lights, which are almost exactly like the better known Northern Lights, only upside-down. What they look like is space clouds curving in from somewhere distant and sifting down the way you think of fireworks sifting down. These were more or less cloud-colored, but in the photos, most of which turned out pretty bad, the lights took on the green color you think of, if you think of that sort of thing at all. The lights are awesome in the original sense of that word, and seeing them entirely accidentally, I understood why they were a thing people journey to see: they touch a very old urge to go out and explore in hopes -- not just of understanding -- but of being mystified, of finding that place where the difference between nature and magic is irrelevant. They're usually a winter phenomenon, the auroras, so these were out of season, but this was New Year's Day, and these were our fireworks in a very lonely place. 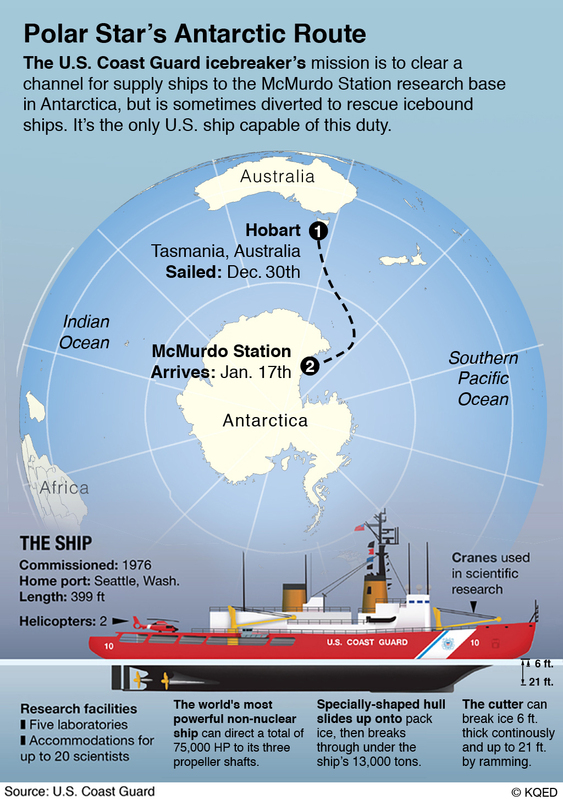 The mission of United States Coast Guard Cutter Polar Star is a straightforward one: sail from home port in Seattle to McMurdo Station on Ross Island off the coast of Antarctica. Once there, make a path for supply ships. Return home. It's a trip that starts around Thanksgiving and ends around early April, barring any unforeseen complications such as icebound fishing boats or onboard fires. McMurdo is a U.S. Antarctic Program base from which scientists deploy across the continent to pursue research in everything from gravitational waves to climate change -- the origins of the universe and the fates of the Earth. McMurdo is in a sound which ices over every year. Polar Star opens the channel so supply ships can get in during the short austral summer, outfit the station for the next year's research, and take out the trash. McMurdo is run by the National Science Foundation, which works with the Coast Guard to make sure there's a way into and out of McMurdo. All of which would be simple enough, but for the complicating factors of entropy and politics, which will embroil the modern empires of Ebay and Russia. About which more later. For now, know this: Polar Star is designed to ride up onto the ice and let gravity do the rest. She can power through about 6 feet of ice pretty handily, or even more if she backs up and rams the ice. Cutting a channel through a dozen miles of "fast ice" (ice connected to land, "made fast" to it) will take more than a week. This process is called "grooming," which has all kinds of other zoological and sartorial connotations that are delightful to think about in the context of this big orange 14,000-ton jet-powered ship lurching up onto thick ice like a beaching whale and splashing gleefully down. I'm told that, onboard, this feels like a series of minor earthquakes going on for a week. I sleep on a top bunk that someone appears to have forgotten to attach retaining rails to, so my childhood fear of falling out of a nice dream onto the hard, hard floor of a Cold War-era icebreaker may well come true. Once upon a time, there were two kinds of uncharted territory. There was the "Here There Be Dragons," "Darkest Africa" kind of stuff, the lands of dangerous unknowns, and then there was the Shangri-La, El Dorado types, mythic places that lured men over the horizon in search of lands surpassing in beauty, fertility, and riches any we had known. 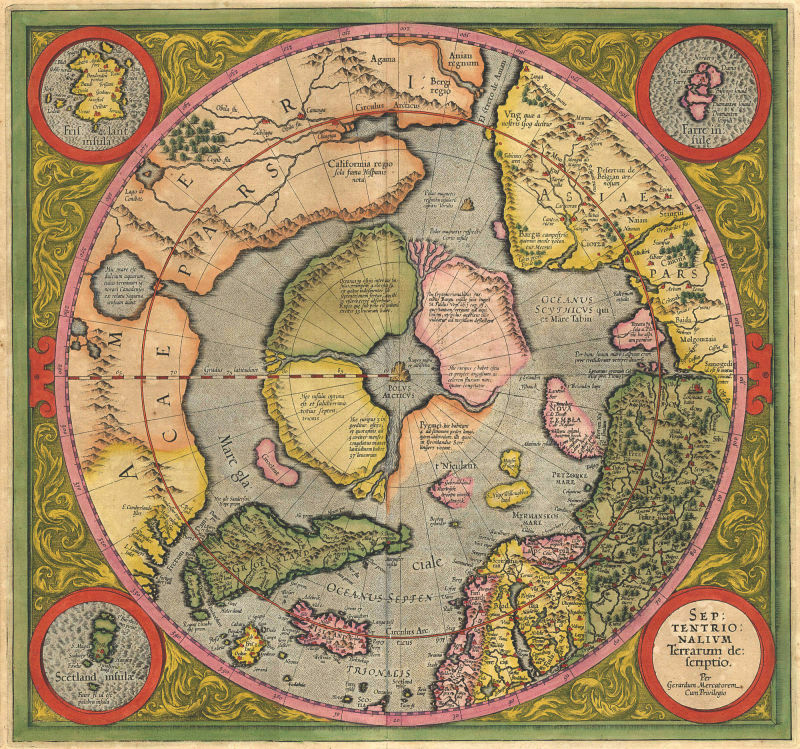 Maps as late as the mid-19th century envisioned an ice-free Arctic Sea, surrounded by temperate regions and undiscovered races of people. People believed this about the Arctic, for whatever reason and against all available evidence (see: giant ice fields and polar bears). Explorers of the Victorian era thought that maybe somewhere in there was a paradise. 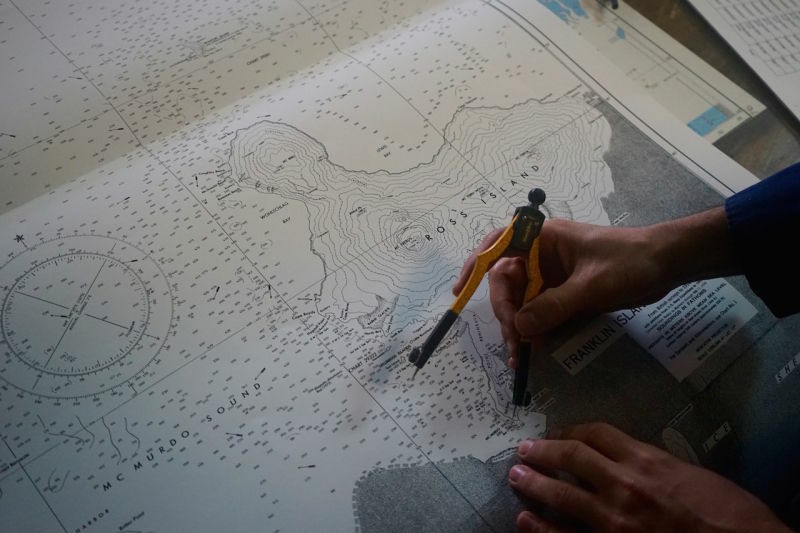 Even Mary Shelley's original Frankenstein story is framed around an expedition to the Arctic. Shelley was making a point about the human need to discover, and the need to cut ourselves to ribbons on that dangerously sharp edge between the known and the unknown. The Arctic held great appeal to people of Shelley's era, the promise of a land better than any other land. But in fact, there's no land there at all. Here's the big difference between the Arctic and the Antarctic: the Arctic is a frozen sea surrounded by land; Antarctica is a frozen land surrounded by sea. The value of the Arctic has historically been in finding ways across it, shortcuts from one empire to the next. Those shortcuts have been elusive; the search for them has led to disappointment and death by freezing and starvation. Now that it's melting, though, some of those fabled passages are appearing, and countries with an interest in controlling the north are trying to find ways to send container ships -- even cruise ships -- across it. The Antarctic has been largely insulated from this, in part because of its supreme isolation from anywhere anyone wanted to go, and partly because of the Antarctic Treaty of 1959, which protects the continent from mining and commercial exploitation. So while 53 countries have signed on and many have planted flags and opened bases and dug around in the snow, no one's been able to use it to turn a profit, or expand an empire. It's been all about the science. Discovery, in other words. An unspoiled land ruled by ideals and penguins. Everyone was looking north for Shangri-La when they should've been looking south. That all stands to get screwed up, too, of course, as we'll see. Polar Star carries some of the motley DNA of Frankenstein's monster. She breaks down a little here, a lot there. She's repaired from a dwindling pool of parts. She carries a lot of new stuff to talk to her old stuff (she's mostly old stuff). Her keel was laid in 1972. She was commissioned in 1976. Think about a 44-year-old machine. Think about how drastically technology has changed since then. Think about the friction caused by forcing this ship to stay in the present. She's all we've got, to do this one straightforward thing in this one lonely place. That's only really a problem when she breaks. Which she did the very next day after the Southern Lights went away and took the night entirely with them.